This Online Virtual School was developed and is managed by a team of volunteers. It has audio supported basic tutorials for self-learning and teaching of basic Sindhi language through Romanized Sindhi Script version of which was approved, adopted and recommended for Global Sindhi use by several renowned Scholars, Professors and Linguists of Sindhi language of India at a Summit Conference that was organized at Sindhu Bhavan, Ahmadabad, India, on 28-29 March 2010. Romanized Sindhi Committee and in fact Global Sindhi community should be grateful to Alliance of Global Sindhi Associations Inc (AGSA formerly ASAA) and Indian Institute of Sindhology Adipur, without whose tremendous help the Summit Conference could not have been organized and become as successful as it was and that became a historic event for Sindhi language post partition of India. This Online Virtual School for Sindhi language is funded by donations from the well wishers to whom the Romanized Sindhi Committee is grateful. 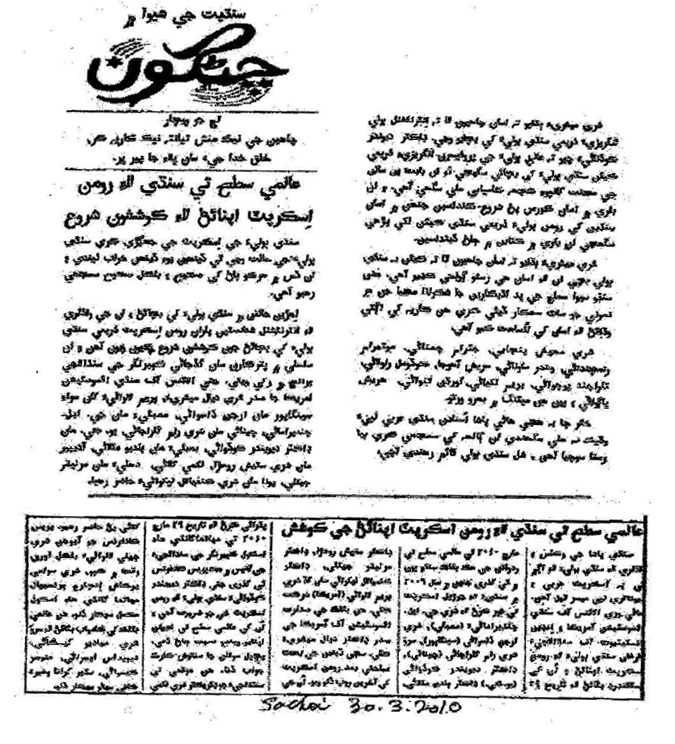 "Actually my first article on Romanized Sindhi was published in Hindvasi in August 1997. Vikram Shahani helped me with the chart in Arabic and Devnagiri scrip. It was full of mistakes. I realized that the future lay in evolving something out of existing computer keyboards. I got an excellent comment from a reader. He wrote “2 cats are already fighting over a piece of sweet; where has this crow come from?” Until today I give credit to the commenter. In 2OO6, Poonam Malani Mumbai helped me to make an alphabetical chart with hand written Devnagiri and Arabic script. I have still preserved it. Then I proceeded with the translations. It was my point of view, that children and elders both should find something interesting So there was folklore for children and short stories and jokes for the grown ups. Before Singapore International Sindhi Sammelan 2007, Arjan Daswani of Singapore took the mantle of introducing this work at the Sammelan which he did, though no immediate results were visible, a seed was planted." – G. L. Chandiramani Mumbai. –www.Chandiramani.com"
In early 2006 when I consented to serve as voluntary Coordinator on 14th International Sindhi Sammelan of Alliance of Sindhi Associations of Americas Inc. (ASAA, now known as AGSA or Alliance of Global Sindhi Associations Inc.), hosted at Singapore in July 2007 by Sindhi Merchants' Association (SMA now known as SSA or Singapore Sindhi Association). Dada Govind L Chandiramani of Mumbai approached me seeking my support to give exposure to his version of Romanized Sindhi Script and get general acceptance by the Sindhi delegates from all over the world who would be attending the said Sammelan. In that respect I called over phone Mr Kishore Lala, then the Vice President of the ASAA, who consented for same and assured me of ASAA's support. I then requested for same to Mr Deepak gurnani, the chairman of the said Sammelan, who put me on to his official on Sindhi language Mr Chatru Vaswani. Mr Vaswani was kind, he heard me, and though he indicated doubt whether Roman Script could fit unique Sindhi word pronunciations, he donated his personal money, printed 300 copies of Dada Chandiramani's 13-paged Romanized Sindhi Script brochure and distributed the same to the visiting delegates. The results showed that Dada Chandiramani's version of script needed some improvements and also that we should produce audios to support the correct pronunciations of the unique Sindhi words. This was conveyed to Dada Chandiramani immediately after the said Sammelan. In the year 2008 Dada Govind L Chandiramani approached me again, seeking my assistance to give exposure to his version of Romanized Sindhi Script and getting general approval of worldwide Sindhi delegates attending ASAA’s 16th internationals Sindhi Sammelan LA-2009. Knowing that the results achieved at Singapore Sindhi Sammelan 2007 suggested some improvements in Dada’s version of Script. I requested my friends Prof. Dr. Devendra Kodwani of UK and Col. (Ret'd) Ram Gulrajani of Chennai for their help. They obliged and joined me and together with Dada Govind Chandiramani, we formed into the "Founding LIFE Committee of FOUR” We then studied Romanized Sindhi Script of other developers which were floating on the Net, discussed with some of them, consulted some scholars of Sindhi language, important of whom were Prof. Dr. Baldev Matlani, then the Head of Sindhi Dept.of Mumbai University, who was introduced to me by a mutual friend late Dada Shyam Gianchandani of New Jersey USA, and Prof Dr. Satish Rohra of Indian Institute of Sindhology, Adipur, Kutch; whom I had met at Singapore Sindhi Sammelan 2007, and also my colleague Dr Devendra Kodwani knew him well. After several discussions, the Committee finally came to achieve Standardized version of Romanized Sindhi Script. That took us to early 2009. I then called Dr Dayal Meshri, then ASAA President, over the phone, who was kind to have heard me what I had to say and upon being satisfied over the cause of Sindhi Community and Sindhi language, he asked me to prepare a resolution that includes full details of the Standardized version of Romanized Sindhi Script, which I did and sent him by Email. Simultaneously I called my friend Mr Mohan Dadlani of California, who was an official on the Organizing Committee of Sindhi Sammelan LA-2009. At my request he agreed to serve as Chairman on Romanized Sindhi Sub-Committee with Agenda to help present the Resolution. And Dr Meshri then assisted by Mr Mohan Dadlani, presented and moved the said Resolution through a large gathering of world wide Sindhi delegates attending the Sindhi Sammelan LA-2009 and with the grace of God it was approved with over whelming majority of the delegates present. When I conveyed the results achieved at Sindhi Sammelan LA-2009 to my colleagues on Romanized Sindhi Founding Committee and the consultants and advisers, they were all very happy. Prof. Dr. Baldev Matlani then advised that in order to achieve broader approval of Standardized version of Romanized Sindhi Script, we should call for a Summit conference of Sindhi language experts of India and Sindh Pakistan. The Founding Committee liked the idea. Our Prof Dr Devendra Kodwani offered his services to organize the Conference. The Committee thanked Dr Kodwani for that. However, the Committee thought that due to Visa formalities between India and Pakistan, that would cause long delay and we should first call for the Conference of Sindhi language experts of India and call for another joint conference between the Sindhi language experts of India and Sindh Pakistan at more opportune time at a later date. The Conference was declared open on 28 March 2010 as scheduled. The meeting started exactly at 9:30 AM. Dr Dayal Meshri chaired the meeting and Mr Prem Lalvani Co-chaired. Prof Dr Devendra Kodwani took charge and handled the Conference proceedings in a very professionall manner. Col. (Ret’d) Ram Gulrajani served as spokesman on behalf of Romanized Sindhi Committee during the entire proceedings. As Arabic Sindhi Script has 52 consonants and English or Roman Script has only 26 consonants, several aspects of combination of existing Roman Script were discussed and deliberated on. This went on for the whole day and at the end of day, with grace of God, with slight improvements made on the version of Standardized Romanized Sindhi Script that was approved at Sindhi Sammelan LA-2009, FINAL version was unanimously approved, adopted and recommended for Global Sindhi use by all present. That became the Historic day for the Sindhi language, pro partition of India. Those who took active part in the discussions on the subject of Romanized Sindhi Script, appear in the photograph below, names of them are written just below the photograph. Invitation to attend the Summit Conference was extended to at least three other developers of Romanized Sindhi Script that floated at the Net, but each one of them insisted that he would come ONLY if his version of Romanized Sindhi Script is presented and not any other. They refused to compromise. We missed them. There was a Press Release which was published on March 30, 2010. Newspaper clipping of which is reproduced below. The version of Standardized Romanized Sindhi Script approved at the said Summit conference was further ratified at a gathering of several world wide Sindhi delegates who attended ASAA's Sindhi Sammelan, Jakarta July 2010. The mantle I took from Dada Govind L Chandiramani, was thus successfully completed to his satisfaction. That also successfully concluded the role of Alliance of Sindhi Associations of Americas Inc, (ASAA now/AGSA) and the Indian Institute of Sindhology, Adipur, and with tremendous help from both Organizations, the Standardized version of Romanized Sindhi Script was approved, adopted, recommended for Global Sindhi use at the Summit Conference at Sindhu Bhavan, Ahmadabad, 28-29 March 2010 and further ratified at ASAA’s Sindhi Sammelan Jakarta, July 2010, And not only the Romanized Sindhi Founding Committee, but in fact the Global Sindhi Community should remain grateful to both these Organizations. However, for the good of Sindhi language, there still remain some tasks that need help of these two Organizations. And they are: (1) to bring this Romanized Sindhi Script in the official Education system of India. That may arrest the closure of Sindhi teaching Schools and the decline in the use of Sindhi language in India. (2) Standardize Romanized Sindhi Script between India and Sindh Pakistan. And that may boost use of Sindhi language globally. Till that is done, the job is still half done. We seek their indulgence for help on this Sindhi language issue. This photograph, taken on 29 March 2010, shows the chief participants who took active part in discussions and deliberations on the structure of Romanized Sindhi Script that was approved, adopted and recommended for Global Sindhi use, at a Summit conference that was specially organized at Sindhu Bhavan, Ahmadabad, India, on 28 & 29 March 2010. From Left to Right: Prof Dr Kanayalal Lekhwani.Pune. Prof/Dr Murlidhar Jetley, Delhi, Prof. Dr Baldev Matlani, Mumbai, ASAA Chairman Mr Prem Lalvani, Chicago, ASAA President, Dr Dayal Meshri, Tulsa OK, Prof Dr Devendra Kodwani, UK, Col )Ret’d) Ram Gulrajani, Chennai, Prof Dr Satish Rohra, Adipur, Arjan Daswani, Singapore, Dada Lakhmi Khilnani, Adipur. Dada Govind L Chandiramani, the founder of the base version of Roman Sindhi Script was absent in the photograph but is shown elsewhere at this website. There was a Press Release made on March 30, 2010. Newspaper clipping of which is reproduced below. PRACTICAL USE OF STANDARDIZED VERSION OF ROMANIZED SINDHI SCRIPT. Dada Gobind L Chandiramani was very happy on the achievement of Standardized version of Romanized Sindhi script for Global Sindhi use and used it in creating short stories and jokes which he uploaded on his website www.Chandiramani.com Dada's website is has also vast information on the music and musical instruments of India. His website has been appreciated by many in the world. After Ahmadabad Summit conference, I realized that for practical purposes, it would be best to establish an ONLINE virtual school using the said approved version of Romanized Sindhi script, supported by audios for teaching correct pronunciations for unique Sindhi words. Out of my passion for Sindhi language, I took this task on me. I consulted with my colleagues on the Founding Committee who supported me whole heartedly. However, in order that this virtual school goes on for long time ahead, it was preferred that it should be put under an ongoing non-profit Sindhi organization. As my first obligation lay to Dada Govind L Chandiramani because he was the original founder of the base version of Romanized Sindhi script, I requested him if he could establish such an ongoing non-profit Sindhi organization, so as I put the virtual school under that organization. Dada Chandiramani showed his inability to establish such an organization. Upon his denial, I as Dada Chandiramani if I could try to put the project for long term care under the ASAA for which Dada raised no objection. I then consulted on this with Mr Prem Lalvani, ASAA Chairman who showed his willingness to cooperate. Mr Lalvani then requested ASAA Treasurer Mr Nand Belani to help organize a website for Romanized Sindhi project. As the approval and decision on the version of Romanized Sindhi Script achieved at Ahmadabad Summit Conference was yet to be ratified at a subsequent meeting, However, I created some base lessons which Mr Belani was kind to have uploaded at a website through a Sindhi IT guy based at NY city. This It guy was good and Sindhyat oriented, he was employed full time by another company, his time available for this project was too limited. Therefore, this site was temporary. Knowing that the project of this nature would require the services of a full fledged IT company. I made enquiries and came to know that the most favourable prices, terms and services would be available from India. I consulted with two such companies in India and chose one whose quotation and the terms I considered as fairer. I informed of this to ASAA Chairman Mr Prem Lalvani over phone and again at ASAA’s Sindhi Sammelan Jakarta 9-11 July 2010. But for this funds were needed. I am pleased to state that I could organize the funds for hosting this virtual school of Sindhi language supported by audios from a friend of mine who shared Hotel room with me at the said Jakarta Sammelan. I did introduce my that friend to Mr Prem Lalvani and ASAA President Dr Dayal Meshri during a lunch hour at the said Sammelan and later Mr Lalvani thanked my said friend over the mike from the stage. After coming back to Singapore from Jakarta Sindhi Sammelan July 2010, I got busier; I got Kindergarten level lessons under the heading of Mithree Sindhi Boli by the kind courtesy of Dadi Sheela Sippy of Sadhu Vaswani Mission Pune, and Primary one lessons by the kind courtesy of Mr Deepak Keswani of Ulhasnagar. As they were written in Arabic Sindhi script, I got them re-written in approved version of Romanized Sindhi script. My colleague Dada Govind Chandiramani expanded Kindergarten lessons with more sentences. Earlier I had prepared Romanized Sindhi consonants and vowels chart, which I got audio recordings done in MP3s. My colleague Prof Dr Devendra Kodwani prepared audio visuals for Romanized Sindhi consonants and vowels with explanations. All the text in Romanized Sindhi in all the lessons were edited by me and all audios too were personally supervised by me. I heard them again and again, got them corrected and where the post partition born Sindhi adults in India could not pronounce them correctly I recorded them in my voice. All that work took few months and I am pleased to write that the fully functional virtual school supported by audios was uploaded on 31 Dec 2010, much to the pleasure of my colleagues on Founding Committee, several Sindhi language professors who helped on the formation of the Script, and of course Mr Prem Lalvani, Dr Dayal Meshri and the Sindhi Community. "Looking back, I remember Arjan once telling me to go to Chandiramani’s site and read the Romanized Sindhi he has used to write some articles and messages. I was impressed and told Arjan that though there is room for improvement, the first effort is certainly laudable. Arjan thereafter doggedly pursued the matter and worked on it with zeal unmatched at his age. He found many wayfarers from the net who put in their suggestions, but left when things became hot and serious. The scholars were apprehensive whether this approach of re-clothing Arbic Sindhi with Roman attire will really work. Many gave their opinions but most were meant to dissuade us than to encourage us. Arjan stood his ground and found two lieutenants in me and Devendra Kodwani to support him to the hilt. As it turned out, Ahmedabad conference on 29.30 Mar ’10 was an historical event when all important Sindhi scholars and academics of Sindhi community of India finally approved our efforts with negligible modifications." — Col. (Retd) Ram Gulrajani Chennai. "On this website, the new Romanized Sindhi script will be very easy to learn. To support the learning and use of the new script audio-visual lessons introducing the Sindhi sounds and corresponding Roman script are being launched which would be available free of charge for everyone to view. The website will also provide short articles, stories and poems written in the new script. The new script chart is also being uploaded here which will be available for download. The website will also start building up a depository of Sindhi words in Roman script with aim to associate each word the meaning in English and audio of the word. The website will have link where the users and well wishers would be able to provide feedback on any possible improvements on the script and/or the functions of this website." – Devendra Kodwani UK (PhD). My friend kept to his word and did fund for the hosting of this project. I have thanked him somewhere at this site. At this site thanks are also given all others who helped or assisted on this project in one way or another. In the year to 2011 I received Primary Two level Sindhi learning and Teaching book by the kind courtesy of Prof. Dr. Baldev Matlani, then the head of Sindhi Dept. of Mumbai University which too I got re-written in approved version of Romanized Sindhi Script and got audios recorded for the lessons, which too were uploaded at the said Online virtual school. I continued to manage this project in consultation with and with support of the Founding Committee. However, sad point is that within one year of launch of this virtual school of Sindhi language, ASAA Chairman Mr Prem Lalvani told me over phone that he did not find anyone in ASAA Board who could captain this project effectively after I am gone. And he suggested that probably Indian Institute of Sindhology would be the right people to handle this project on long term basis. With his advice I approached Dada Lakhmi Khilnani, Director of Indian Institute of Sindhology, Adipur, Kutch and Dada Khilnani showed his willingness to take on to this project. At ASAA’s Sindhi Sammelan Ahmadabad 16-18 Dec 2011 two things happened for this project. ONE: www/RomanizedSindhi.Org was officially announced before the large gathering of the Sindhi delegates who came from all over the world. At same time Romanized Sindi consonants and vowels coloured Charts that were specially printed for the occasion were distributed among the delegates. TWO: On behalf of ASAA Dr Dayal Meshri signed and handed and Dada Lakhmi Khilnani signed and accepted the project of Romanized Sindhi for management under Indian Institute of Sindhology in the presence of Mr Prem Lalvani, Dr Devendra Kodwani and Arjan Daswani. ASAA Treasurer Mr Nand Belani handed a small sum lying in the books of ASAA as balance from the donations Arjan Daswani had collected for project of Romanized Sindhi, to Dada Lakhmi Khilnani converted in cash in Indian Rupees. Before his demise, Dada Chandiramani had started to write 10,000 worded English to approved version of Romanized Sindhi Dictionary which he was keen to put up to a website www.Chandiramani.com Mrs. Kajal A Ramchandani (a Senior Sindhi language Teacher at Jai hind college Mumbai) was assisting Dada, as a volunteer, editing Romanized Sindhi spellings of meanings in Sindhi that Dada was typing in Romanized Sindhi Script. I offered my help to Dada and he was pleased. However, I suggested to him that in order to go at a faster pace, we should get the type writing work done by some one for a small fee. Dada agreed to that. Previously one Miss Rafia Sarwar Shaikh , a Gold Medallist in Computer Science from Hyderabad Sindh, had helped me type in translations in Romanized Sindhi from Arabic Sindhi, on the Sindhi learning lessons that are uploaded, supported by Audios at this website. I found her work was good. I contacted her for Dictionary work but she told me that she was busy with other work at that time. At my request, she asked her friend for this work, whose quotation was fair. And the job of Dictionary was given her. At my advice Dada Chandiramani sent a book of Parmanand's English to Arabic Sindhi Dictionary by courier service. In that book Dada had ticked 10,000 English words with meanings in Arabic Sindhi. Work had of typing in on Excel sheet commenced at Hyderabad Sindh. At ASAA’s Sindhi Sammelan Ahmadabad 2011, when Dr Dayal Meshri handed the project of Romanized Sindhi for management by Dada Lakhmi Khilnani under Indian Institute of Sindhology, I did mention to him of this Dictionary work. Dada Khilnani told me that the entire Dictionary work of typing 10,000 English words with their meanings in Sindhi in Arabic Scripts and including creation of 10,000 audios in MP3 format, was done under his care at Indian Institute of Sindhology Adipur. He was too keen on that. Therefore, work at Hyderabad Sindh was stopped. Excel sheets with 10,000 English with their meanings in Arabic Sindhi were already typed in. I called for those sheets which I received in email by an attachment. These half done sheets were sent by email to I.I. of Sindhology. I paid the money to the girl in Hyderabad Sindh through Ms Rafia, for the work she did. It was paid from donations that I organized. Additionally I organized full payment of creating this entire Dictionary with 10,000 audios which amount went by wire transfer from Singapore directly into the Bank account of Indian Institute of Sindhology, Adipur, Kutch. At the instructions of Dada Lakhmi Khilnani, one of his staff Mrs Rajni Valecha went on editing the work that was done at Hyderabad Sindh and typing in Sindhi translations of English words in Romanized Sindhi. For that she based her work on Romanized Sindhi chart that our Prof Dr Devendra Kodwani had sent her. Dada Govind L Chandiramani had introduced to us Mrs Kajal Ramchandani in December 2011. She was co-opted to Romanized Sindhi Committee in January 2012. As Mrs Rajni went on typing sheets, she went on sending them to us which Kajal went on editing for spellings of Romanized Sindhi, and also, in consultation with Romanized Sindhi Committee, meanings in Sindhi of any doubtful words. II of Sindhology took almost 18 months to deliver the type written Excel sheets which time was very much beyond schedule as the time projected for was only six months. But we came to know that Rajni was doing this work mostly after office hours and therefore her work is justified. The sad part is that the gentleman who was supposed to have recorded 10,000 audios in his voice for the Sindhi meanings of the words in Dictionary, meanwhile got ill and subsequently passed away. In his life he had done lot of good work for Sindhi Community and Sindhi language. The Community lost this Hero. But the sad part of it again is that the 10,000 audio recordings were not delivered to us. As we did not want to lose any more time, we preferred to wait no more but get the job of recordings done from the Sindhi recording specialists in Ulhasnagar. As money for recording of these 10,000 audio recordings was already paid to II of Sindhology, because II of Ssindhology does lot of good work for Sindhi language and Sindhi Community in general, and to maintain our good relations with them, we considered that money as our donation to them with good heart. We gave this recording of 10,000 audios to two Sindhi audio recording specialists at Ulhasnagar. For which payment was made from the fresh donations organized. However, these Sindhi recording Specialists are born post-partition of India and some words they were not pronouncing correctly. I was personally hearing and editing Each recorded audio and some words I got them re-recorded, some unique words which they could not pronounce correctly even after two trials, I recorded them in my voice. All 10,000 audios were thus completed. Further feedback is welcome please for any improvements. I am sorry I could not complete this Dictionary work while Dada Chandiramani still lived but I am sure he is watching us from Heavens above and blessing his own project. DISCLAIMER: As this Dictionary is prepared by amateurs, it is meant to give general guideline only and must not be used for any legal purposes. When ASAA handed over the project of Romanized Sindhi to II of Sindhology in December 2011. I was very happy and thought the project found that non-profit Sindhi Organization who would manage it and look after it on an ongoing basis for long time ahead. I knew they and their Directors had a good track record of promotion of Sindhi language and Sindhi culture. They were all dedicated workers. However, within two years from December 2011 I found that they were too busy on their bigger projects and commitments and in fact they had no time for the project of Romanized Sindhi which remained completely ignored. As I had mothered this project for many years, I could not bear that. Consequently, in consultation with ASAA Chairman Mr Prem Lalvani and Romanized Sindhi founding Committee, I took back the management entirely on me and have been managing it ever since and also organizing and paying for Domain, Hosting, and maintenance costs of the IT people and paying by donations that I organized from the well wishers of Sindhi language. Mrs Kajal continues to serve on this project diligently and her services are widely appreciated. Dr Vijay Bhatia of Pennsylvania, PA USA joined us and was co-opted to Romanized Sindhi Committee in March 2012. He has helped the project in many fields and has great devotion doing this voluntary work. When I first sent Excel sheet of Dictionary for uploading, he did overview of same and some slight corrections were made before I sent for uploading. Later we issued the same Dictionary on DVD in the year 2015 on which too he has done re-edit which will be updated and next DVD edition would have the modifications. Dr Bhatia’s help and the work has been very useful and appreciated. 3. Learn Sindhi - 1, Romanized Script A global Solution.....September 2013 .....by Kamal Mirchandani - Sindhu Academy USA. 4. Learn Sindhi - 2, Romanized Script A Global Solution.....July 2014......by Kamal Mirchandani - Sindhu Academy USA. Additionally, Dada Kamal has also been conducting Workshops for promotion of Sindhi language, based on audio supported Tutorials uploaded at this website, important of which are in Kuala Lumpur year 2014, on Board the Cruise at Caribbean Seas year 2015, on Board the Cruise Singapore – Hong Kong year 2017 and at Hyatt Regency Santa Clara, California, year 2018, all of them on ASAA/AGSA’s Sindhi Sammelans. At Kuala Lumpur Dada’s Workshop was combined with Mrs Kajal Ramchandani. Col (Ret'd) Ram Gulrajani, Chennai. A retired Colonel of Indian Army. A "Life" member of the Founding Committee. Has served this project actively from A1 day. Current he serves as Adviser but would help when possible. Mrs. Kajal A Ramchandani - Works full time as a Senior Sindhi language teacher at Jai Hind College Mumbai. As served on this Committee since January 2012. She was the Chief who edited Romanized Sindhi spellings in the Sindhi meanings in Dictionary uploaded on this website. Promotes Sindhi language by conducting Workshops based on audio supported Tutorials uploaded on this website. Dr Vijay Bhatia, Works full time at Pennsylvania, PA, USA. Has served on this Committee since March 2012/ Helps on many technical issues on this project. Arjan Daswani, Singapore. A retired businessman. As “Life” member of the Founding Committee. He was the chief force that leads to achieving approved version of Romanized Sindhi Script for Global Sindhi use and creation of this Online Virtual School of learning and teaching of basic Sindhi language. He continues to manage this project in consultation and assistance of his colleagues on Romanized Sindhi committee. Some years ago I received a phone call from some one in Sindh Pakistan who objected to removal of consonant Q from our Romanized Sindhi Script. I told her that was the decision made by several Sindhi language Professors and Linguist of India at a Summit conference specially called for the Romanized Sindhi Script that we use and any changes should be discussed and decide upon on Sindhi language authority level of two countries, India and Sindh Pakistan. However, for several months now I see that Sindhi language authority of Sindh Pakistan have exhibited Romanized Sindhi Script chart at their official website, and the consonants shown are almost 99% same as he ones we have used on our Script. The Romanized Sindhi Committe and infact the entire Global Sindhi community should be grateful to Alliance of Global Sindhi Associations Inc (AGSA. Formerly ASAA) and Indian Institute of Sindhology for their tremendous help in achieving the approval of the Romanized Sindhi Script for global Sindhi use. The AGSA has further helped in the promotion of Sindhi language through Workshops conducted at their Sindhi Sammelans. The Romanized Sindhi Committee prays for support of these two Organizations for all future for the benefit of Sindhi language and Sindhi Community. This project was created by individual volunteers, and paid for totally through the donations from the well wishers of the Sindhi language and the from A1 day till today. This project is also grateful to ASAA/AGSA for receiving some donations for Romanized Sindhi into their Bank account and paying out from that amount, for expenses on the said project, promptly, as and when needed. All members of Romanized Sindhi committee are individual volunteers and work on honorary basis out of their passion for Sindi language and the Sindhi Community. They are not obligated to or governed by any Organizations. However, they respect each Organization that helps on this project And seek their cooperation and assistance at all times.